Webtrends Top 12 June, 2009. Below: 35 leading countries in Global Response to this site. The ATA Conference has come to one of the world�s most outstanding safari and conferencing destinations and venues. The ATA provides a unique networking, learning and agenda-shaping platform for tourism stakeholders. The most cursory glance at its forthcoming Nairobi programme reveals content-rich educational and professional sessions; a tourism ministers� roundtable; meet-the-media encounters; buyers-and-suppliers interactions and transactions; and outings to Nairobi�s world-class sights, including the only national park in the world on the immediate environs of a metroplolis. The ATA has a distinguished and proactive history. Established as an international non-profit, non-political, educational trade organization in New York by a group of travel and airline executives, ATA went on to pioneer the establishment of National Tourist Boards, providing a forum for the learning and professional development of Africa travel agents and tour operators� knowledge, and helping establish incoming operators in Africa. The then young African nations received invaluable assistance and know-how with shaping their tourism capabilities and building their credentials. 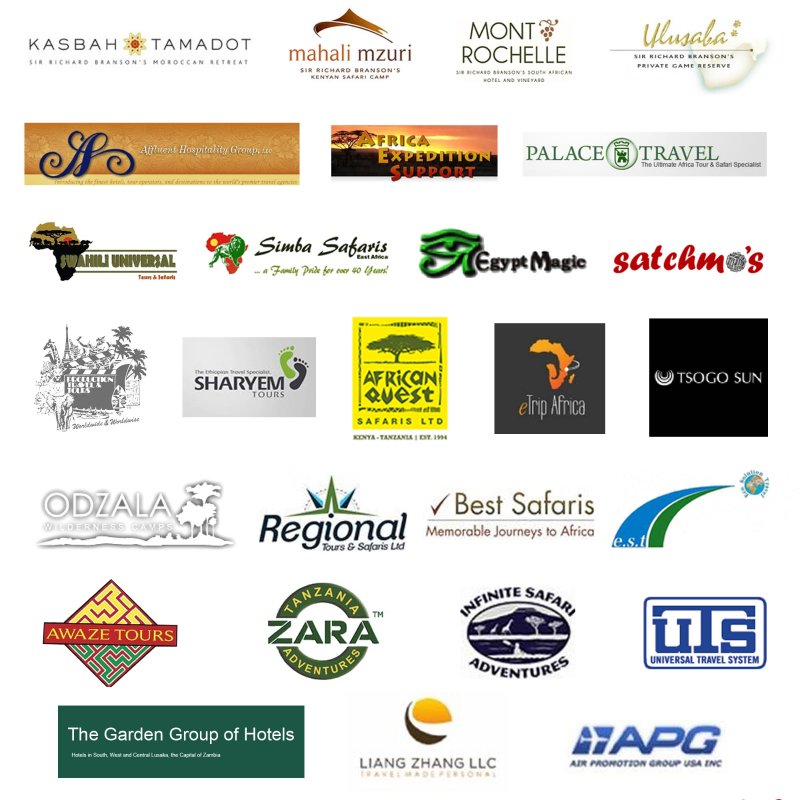 ATA�s investment in African tourism has been inestimable. This untold capacity building has, over the years, included engaging tour operators and small-scale tourism businesses in North America and around the world with networking events, educational seminars and consumer and travel trade shows. In the US alone, over 250,000 prospective tourists are exposed to Africa�s tourism assets face-to-face by ATA members. In an immense collaborative and proactive effort with US, Canadian and world press/media, ATA works to expound the good side of out-of-Africa news, and to report on the development of tourism projects and destinations. We welcome the ATA to Africa being well aware that their primary objectives and focus have been to promote the tourism attractions of the African continent and to educate travel agents, meeting and conference planners and incentive companies about the products and services offered by Africa�s tourism industry. The ATA thus helps to identify new tourism products and destinations for the benefit of the local populations and the international travel industry. By meeting in Nairobi, the ATA will in very many senses be coming home to the arena and one of the hubs of its life�s work. Kenya is one of the world�s foremost homes of hospitality. Kenyans delight in hosting Africa and the rest of the world at home. Workshops, conferences, conventions and summits held in Kenya constitute some of the participants� most unforgettable, satisfying and gratifying experiences. We invite you to join us for ATA's 40th Annual World Congress in Nairobi, Kenya from November 9-14, 2015, where we will be hosted by the Kenya Ministry of East African Affairs, Commerce and Tourism and the Kenya Tourism Board. November 9th, David Sheldrick Wildlife Trust. Born from one family�s passion for Kenya and its wilderness, the DSWT is the most successful orphan-elephant rescue and rehabilitation program in the world and one of the pioneering conservation organisations for wildlife and habitat protection in East Africa. Learn more..
November 11th, Karen Blixen Museum and Giraffe Center. The museum was once a farm at the foot of the Ngong Hills owned by Danish Author Karen and her Swedish husband, Baron Bror von Blixen Fincke. Located 10km from the city center, the farmhouse gained international fame with the release of the movie �Out of Africa� an Oscar winning film based on Karen�s autobiography. Learn more. Lake Nakuru National Park. On the floor of the Great Rift Valley, surrounded by wooded and bushy grassland, lies the beautiful Lake Nakuru National Park. Visitors can enjoy the wide ecological diversity and varied habitats that range from Lake Nakuru, surrounding escarpment, and picturesque ridges. Ol Pejeta Conservancy. Today Ol Pejeta is the largest black rhino sanctuary in East Africa and home to three of the world�s last remaining northern white rhino. It is the only place in Kenya to see chimpanzees in a sanctuary established to rehabilitate animals rescued from the black market. Arrive early or stay beyond the congress program to further explore Magical Kenya with special pre- and post-congress tours offered by ATA members. 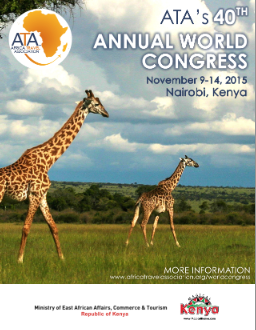 NEW YORK, NY, April 14, 2015 � The Africa Travel Association (ATA), the leader in promoting tourism to Africa, will hold its 40th Annual World Congress in Nairobi, Kenya from November 9- 14, 2015. The international tourism meeting will be hosted by the Kenya Ministry of East African Affairs, Commerce and Tourism under the auspices of Cabinet Secretary Hon. Phyllis Kandie. Known as Magical Kenya, the country offers an abundance of wildlife opportunities, as well as an astonishing diversity of landscapes and cultures. As the East African hub for business and technology, the country is known for its excellent domestic travel infrastructure and the wide range of tourism activities and services it provides for its visitors. From tropical forests and beaches to vast deserts and majestic mountains, tourists in Kenya can experience a different safari every day. ATA Congresses provide a unique networking, learning, and agenda-shaping platform for Africa tourism stakeholders. The 2015 program will include a line-up of educational and professional development sessions; a Tourism Ministers� Roundtable; sessions to Meet the Ministers, Meet the Media, and Africa Meets the World, where buyers and suppliers will meet; visits to Nairobi�s top sites; and a range of networking events, including a Kenya Culture Night and ATA Awards Ceremony, receptions, working lunches, and a gala dinner. As the early founding members of the association, the Kenyan government shares a special connection with ATA. The first ATA Congress in Africa was hosted in Kenya in 1976 and the Kenyan Government has fostered a tradition of hosting the ATA Congress every ten years. �Our partnership with ATA is very important as the U.S. remains a significant source market for Kenya. The Kenya tourism industry is looking forward to welcoming ATA delegates for a successful conference in November to highlight all the country has to offer,� said Kandie. During the Kenya Host Country Day, delegates will visit the magnificent Lake Nakuru National Park. The lake itself is known for attracting thousands of flamingos that feed on the algae formed on the lake bed. Not only does the lake attract flamingos, but as part of a National Park, both the black and white rhino can be sighted as well as large herds of zebra, impalas, waterbuck, and buffalos. As part of the Host Country Day and an ATA tradition, delegates will take part in a tree-planting ceremony at Lake Nakuru as a symbol of long-lasting relationships and as an initiative to achieve a better global environment. ATA Congress delegates include African tourism ministers, industry professionals representing tourism boards, destination representatives, travel agents, tour operators, ground operators, airlines, hotels and accommodations, service providers, and travel media. Participants from the corporate, nonprofit and academic sectors are also expected to attend along with travel and hospitality students. Pre- and post-Congress tours will also be available to explore Magical Kenya beyond the Congress. More information on the program, hotel accommodations, and special airfares will be posted on ATA�s website at: www.africatravelassociation.org/worldcongress. For photos of Kenya, visit ATA�s Destination Africa profiles on Flickr: https://flic.kr/s/aHsk5eGpu5. For information on sponsorship opportunities for the 2015 Congress, contact ATA at +1.212.447.1357 or info@africatravelassociation.org. To learn more about Kenya, visit the Magical Kenya website: http://www.magicalkenya.com. Download the Congress Flyer here. NEW YORK, NY, April 6, 2015 � The Africa Travel Association (ATA) announced the election of its new International Board of Directors and International Advisory Council. The International Advisory Council was elected during ATA's 39th Annual World Congress in Kampala, Uganda and subsequently elected the new International Board of Directors. Hon. Dr. Maria Mutagamba, Minister of Tourism, Wildlife & Antiquities, for the Republic of Uganda, assumed the role of president of ATA. Minister Mutagamba succeeds Hon. Walter Mzembi, the Zimbabwe Tourism and Hospitality Industry Minister, who served as ATA�s president from May 2012 to November 2014. During his tenure, Minister Mzembi actively promoted ATA�s mission to advance travel and tourism to Africa. The ATA community continues to grow! Have a look at who has joined and renewed in 2015.